The first priest to bring together a flock of Catholics in Morehead City was a Passionist by the name of Father Egbert Albert, who held services in and preached from a railway chapel car in the late 1920s. Legend has it that he warned the people of God's displeasure if his messages were not well received and left, shaking the Carteret County dust from his feet. Directly thereafter a major fire struck the town and a committee was sent to ask Fr. Egbert to return. The chapel car was a Catholic Church inside a railroad Pullman car. It was 84 feet long; its interior was constructed with pews, instead of the normal coach seats, providing seating for 75 people. The main features of this church on wheels were an altar on which Mass was offered daily, a small sanctuary behind an altar rail, stations of the cross, an organ, a confessional and a large-sized crucifix on the side of the altar. There was also a lavatory, a library and a kitchen. The car even had stained glass windows along the upper length. There was a cast-iron stove to keep the chill off. Fr. Egbert persuaded a Mr. West, a non-Catholic land developer, to donate two lots on 17th Street and on this site, the new church was to be built. Shortly thereafter, Fr. Egbert went north to Massachusetts to being a retreat at the Passionist monastery in late January 1929. On February 4, he was taken to the hospital and died three days later. 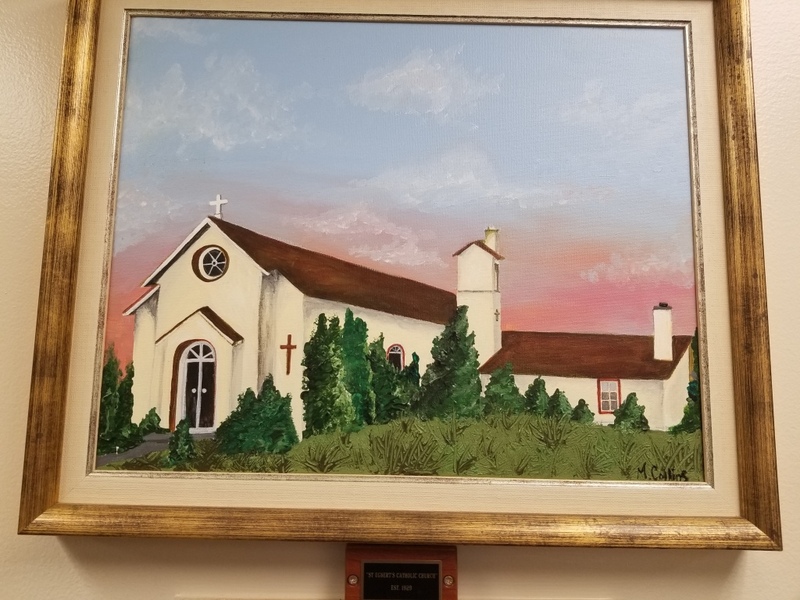 He had made many friends in Carteret County and when news of his death reached them, a drive was made to raise funds to build the church as a memorial chapel in his honor. Construction was started in April 1929 and it was dedicated on June 23, 1929. Priests from New Bern would come to Morehead City to serve the small community, but it slowly grew until by 1954 there were about 100 families. Over the next two decades, the growth demonstrated the need for a larger building and the ground was broken on February 4, 1979, with the building completed on March 19, 1980. In honor of this achievement, there will be a Triduum of Adoration at the church starting at the 11 a.m. Mass on Sunday, March 19, ending with a procession at 6 PM on Tuesday evening, March 21. A plaque honoring Father Egbert Albert is in the prayer garden of the main church and the wooden cross, sheathed in tin, which crowned the first wooden cross, sheathed in tin, which crowned the first Catholic Church in Carteret County is saved and is in the Agape Room of the parish center. --This story adapted from material written by Jackie Hubbard with assistance from the Passionist Historical Archives.